The British Oceanographic Data Centre (BODC) has recently upgraded its network infrastructure to cope with the demand on services. This investment will allow us to maintain our high standards in web data delivery, cater for the 30% year on year increase of registered web users and help us achieve our aim of making all of our data holdings accessible via the web. Our Information Technology (IT) infrastructure (servers and networks) are maintained by our local IT support group (POL Computing). 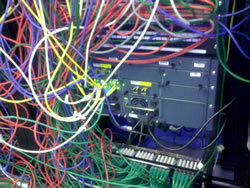 In turn, POL Computing are supported by NERC's IT Solutions & Services (iTSS) who provide specialised expertise. We will continue to work closely with these groups to maintain and develop the IT infrastructure we depend on as part of our commitment to improving access to our data holdings and web services. Version 2.12 of GEBCO Digital Atlas (GDA) software interface has been released. This supersedes previous versions and is available for download by existing GDA users, along with instructions on how to install and use the software. 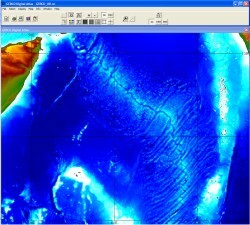 The GDA is a reference source for the bathymetry of the world's oceans. It contains a global set of digital bathymetric contours, coastlines and gridded bathymetric data sets. It is accompanied by a software interface, which allows the user to display, query and export data from the various GDA data sets. The GDA is currently distributed on CDROM and does not include the GEBCO_08 Grid. An updated DVD product is planned for release shortly to include both gridded data sets.